I’ve been wanting to create another puzzle hunt since 2015, when I did one on my webcomic website. However, I started to create large scale escape events, and those took up an intense amount of creative energy and time. When I heard Justin Nevins wished to create a puzzle hunt (or maybe I told him he wished to), I thought this would be an amazing opportunity to get another puzzle hunt going. 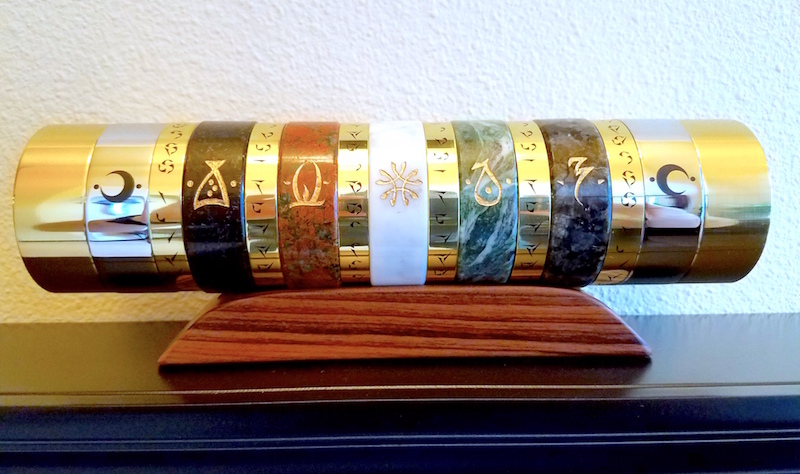 And then he told me he wanted to create a custom made cryptex to give as a final prize. I knew this had to happen, because look at it! I think there’s real gold in there too. Good grief. It’s now a month or so after the puzzle hunt was launched. I’m still exhausted from it, but I’m extremely happy and grateful for all the people involved. 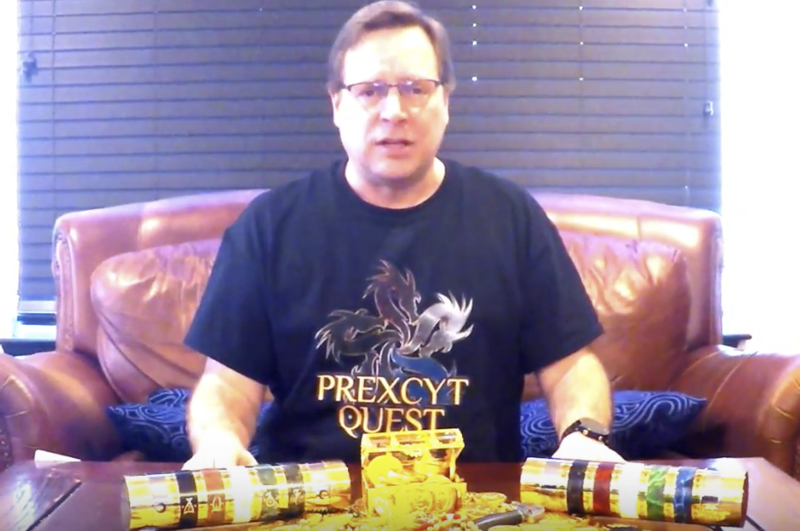 First off, I want to thank David and Lisa for their amazing help in promoting the Cryptex Hunt! They had an interview with Justin, they created a primer for those who were confused, and their Prexcyt Quest Experience in gifs is brilliant! A lot of people were introduced to puzzle hunts, MUDs, and Errol hatred because of them, so that’s awesome! In the beginning, I approached a lot of people. I asked Dan Egnor, Darren Miller, David Lewis, Manda Whitney, Ruby and Mike Yuan, and Margaux to help out. They said yes, but probably because they didn’t know what was happening. I also went to some creative friends to help me build the world. I wanted stories, I wanted music, I wanted a lot of material for Prexcyt. If you check out the Prexcyt.com website, you will find all the authors, who helped create the Prexcyt Anthology. I was overjoyed by the stories, because it was far better than anything I could produce (for those of you who have read the anthology, you can see this for yourself). So my thanks go out to Debbie Ridpath Ohi, Julia Nevins, Kari Maaren, Lizette Tanner, Mags Storey, and Manda Whitney! They helped bring Prexcyt alive and I loved what they did with the stories they gave. I’ll also mention that all of this was done on the MUD engine called CoffeeMud, which was created by Bo Zimmerman. None of this was possible if it weren’t for his amazing support of this software (I started asking questions about it back in 2015). Alex Wai was a trooper. He volunteered to beta test all the puzzles, and he did so diligently. On the final night before the finale, after we had to create 4 or 5 puzzles to compensate for the server crash, he and David Lewis stayed up all night beta testing the puzzles and the flow. Did the cryptexes still work? Did they allow people to progress? Do the puzzles still make sense? Just thinking about that gives me chills because I was up until 2am, however they were up much, much longer. I was overjoyed they could test it out. Manpans (Manda) was our hint queen. She also handled the public relations. On the first weekend, she was bombarded with hint requests. She got it on the email, she got it on twitter, she got it in the game. And she rose to the task, and did everything she could to improve the hint giving process. All the scoreboards were done by David Lewis. I asked him to take it over, and then I forgot about it. Do you know how nice it is to not worry about certain aspects of the project because it’s in good hands? It’s amazing. My fellow “sages” were amazing. Darren spit out puzzles like nobody’s business. And to make things easier for me, he learned how to code in the MUD and build scripts so I didn’t have to do it. In fact, he programmed the idol in the Drow Dungeon which was huge because I was trying to get it ready before the launch. And Egnor was the true “sage” in all of this. He’s the one with experience in the puzzle hunt world, so I bombarded him with questions. He gave us counsel and guidance throughout the whole thing, as well as a few puzzles and that was amazing. Finally, thanks goes out to Justin Nevins himself. He put an immense amount of work in, and pretty much trusted us with everything. That’s no mean feat, leaving me in charge of things like that. Poor guy. I am extremely grateful for his commitment to quality and customer service in this hunt. A lot of the puzzle hunt direction was due to him and what he hoped for the hunt, and he was right! He wanted the hunt to be for those new to puzzle hunts, and we had a lot of first time puzzle hunters! He wanted the puzzle hunt to go on for a month afterwards, and a lot of people finished on the final day. He wanted to give out daily prizes and committed himself to doing so. 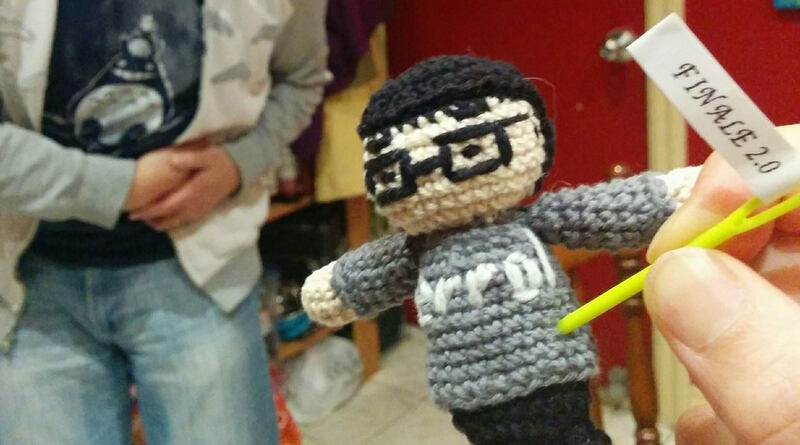 He also wants to take my voodoo doll, seal it in a cryptex, and then bury it somewhere. Waste of a good cryptex in my mind. Speaking of which, this is brilliant. Thanks to Andrea for commissioning Stephannie Faulds to create this! I get involved in a lot of projects, and lately, I’ve been fortunate and blessed to have found people who are dedicated to delivering excellence. These people went above and beyond to make sure the experience was an epic one, and they are all volunteers! it’s rare to find such commitment and dedication and I could not be more pumped by the results of cryptex hunt. So my deepest thanks goes out to all of those who have helped out. And my thanks also go out to all of our players: for their stories, their understanding (when things went horribly wrong), and for their enthusiasm! It was a wild but wonderful week, and it was amazing to share it together! P.S. Sorry about the web puzzle.